Start today and order your course now by clicking on the button to the right. Full tutor support is included and you will have access for up to six months. You can start your course within five minutes. The IOSH Managing Safely eLearning course is designed to get you the results you need and in the shortest time possible. You don’t have to sit in a stuffy classroom for four days and drink horrible coffee while eating stale sandwiches. Your online course will enable to you get on with your schedule AND take the course. It’s less expensive too which is nice for those who need to manage their budgets. You can buy now and start within five minutes! The IOSH Managing Safely training course is perfect for managers, supervisors, directors and other key members of staff. People in those positions are tasked not only to lead by example, but also to consistently remind their team members of how crucial it is to uphold their company’s established health and safety practices, and persuade them to carry out these practices for the great benefit of the organisation they all serve. This module reinforces the role of managers in making sure all members of their team understand the significance and uphold the principles of managing safely. Risk assessments and a simple scoring system are introduced in this module, and delegates are given the chance to execute both. This examines how risks can be fully controlled or reduced through specific techniques and methods. This module rounds up the demands of the law and how the legal system works in reinforcing a health and safety management system. This is where all main issues of any operation are tackled – everything from entrances and exits, to work traffic, to fire, to chemicals, electricity, and so much more are discussed. This sheds light on the importance of determining the “path” of workplace accidents, and how to properly go about it. This explains how checking performance contributes to the improvement of health and safety in a work environment through basic performance indicators, auditing, and proactive and reactive measuring. What is the IOSH Managing Safely eLearning Course? The IOSH Managing Safely eLearning course is the perfect way for you to gain this highly respected certificate in the comfort of you own home or office. Your course is entirely online which mean you don’t have to travel to a training venue. This helps save time and money! This online course is the EXACT same course as the classroom taught course. As a matter of fact, the certificate you will receive after you pass the course is the same as well. You will learn at your own pace and around your own schedule. It’s a fast and easy way to take your course. All eight modules are designed with you in mind. Each module is a nice bit size chunk of information which is easy to consume. At the end of each module is a quiz to help assess what you have just learned. There are plenty of interactions, games and self-assessments to ensure you are on the right track. We say it will take about 24 hours of online study to complete. Being that it’s self-directed learning though, it may take longer or even shorter to complete. It’s just a guideline really. If you have to re-visit a particular module several times in order to understand it…..do it! It’s perfectly fine to go back and make sure you understand. You won’t feel pressured like a classroom taught course. Learn at your own pace and around your own schedule. You will have six months to complete the course so take as much or as little time as you feel you need. If you get stuck, don’t worry. You have full tutor support for the duration of the course. This means if you just don’t understand something and could use that little bit of extra coaching, we are there to assist. Get started now. Use the ‘buy now’ button and you could be on your way to your IOSH certificate in five minutes! The course is not designed to turn people into safety experts. However, all who choose to take it have much to gain in learning why health and safety are integral to what they do as industry professionals, and the benefits of being “informed” can extend to their own personal lives. By passing this course and having your certificate, you are showing your current or future employer that you are serious about health and safety and have the ability to manage common hazards and risks in the workplace. It will certainly set you out from the crowd if you are looking for new employment or trying for a new position at work. Safe operations are always more productive. That’s why every enterprise should know the best practices for managing their daily processes safely. 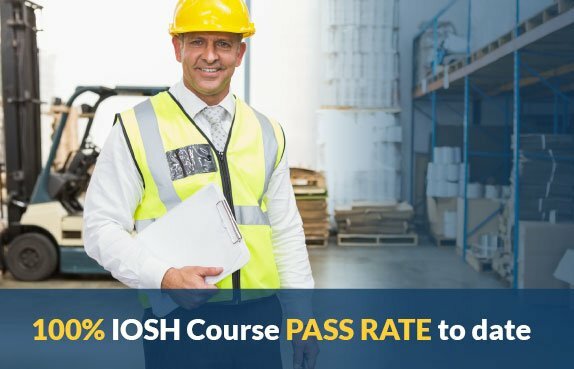 To help establish the soundest practices for health and safety in the workplace, IOSH has designed different training courses that business owners and employees can take, and the most appropriate one for such a purpose is the IOSH Managing Safely Training course. Basically, it’s a training course designed to teach managers and supervisors to effectively implement the practical actions in handling health and safety in their teams. The IOSH Managing Safely Training course is intended for managers, supervisors, directors and other key personnel. These people are usually tasked not only to lead by example, but also to consistently remind their team members of how crucial it is to uphold their industry’s established health and safety practices and persuade them to carry out these practices for the great benefit of the organisation they all serve. In smaller operations, it’s the business owners’ job to make sure that they operate within regulatory controls, so they are the ones recommended to take this course. Also, those who are thinking of starting a business can benefit greatly from taking this course as this will help ensure a solid foundation is built when it comes to managing health and safety in the workplace. It’s simply better to get the training early on and create the right culture and process for the business before it booms; this way, no “un-training” – which normally takes a really long time – needs to be done. The exam for this course is entirely online and consists of a 30 question multiple choice exam as well as a risk assessment project that you email back to us using the forms that are provided. The exam process is super easy and you can complete it in the comfort of your own home or office. There isn’t any need to drive to an exam centre. Stay at home and complete it wearing just your shorts if you wish. We don’t mind! The course follows the latest IOSH Managing Safely syllabus and consists of 7 modules, end of module quizzes, free tutor support and an interactive, presentation style format. Your online exam and IOSH Certificate is included in the low price as well! The IOSH Managing Safely exam is entirely online! You will have 30 multiple choice questions and will also need to complete a risk assessment project. But don't worry! We supply everything you need to be successful including detailed guidance and all of the forms you need to complete. We've got you covered!